Last year Qualcomm released the Snapdragon 810 which suffered problems with extreme thermal throttling, making the performance over extended use deteriorate. Before its launch there was a rumor that the 810 would outperform any other CPU on the market with Qualcomm choosing to use the implementation of ARM’s Cortex cores. But later in 2014 there was rumors surfacing from Samsung saying the Snapdragon 810 suffers from overheating issues. So samsung decided to use their in-house Exynos 7420. Leaks of a Snapdragon 820 have surfaced, and it scores exceptionally well with an impressive score of 146,355. This score was acquired by a phone dubbed the Maryland Rockwille Zenimax Media, the real name and origin of this device is unknown but the hardware specs about it has been revealed. The hardware specifications for the device stand at a rear camera of 21MP, 4GB of RAM, 64GB of internal storage, screen size 6.2 inches and Android 6.0. The Snapdragon 820 will be using more integration of its GPU, Processor these are the Adreno 530, four Kryo cores and the Hexagon 680. This approach seems to be working for the company so far, as some recent benchmark scores suggests a great improvement over the previous generation Snapdragon 810. What's impressive is that this score beats the benchmark score of the unreleased Galaxy S7. 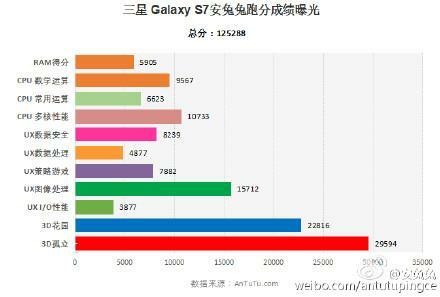 The Galaxy S7 uses an Exynos 8890 which fell short of the Snapdragon 820 with a score of 125288. This really makes the difference between ARM cortex and Kryo cores apparent.